Chart Wealth... Defense Sector Fires Profitable Volley! October 2007, Volume 4 Issue 4 Know It - Profit! In this issue, Esterline Technologies Corp. takes charge of the PHLX Defense Sector Index. Also, will the Dow Jones Industrials be able to break resistance at 14,000? And... what do the Trend Oscillator, Swing Histogram and Speed Dot all have in common? The broad market indices remain in positive territory. The Dow Jones Industrial 30 (^DJI) continues higher... up 11.39% for the year. The current up-trend in this daily chart of the Dow was confirmed in mid-September when the Trend Oscillator moved above the zero-line. The Swing Histogram continues to peg the 100-line... evidence of the strong trend. Additionally, the Speed Dots are well aligned. The first dot to drop off-line will forecast a price move down into an area of support between 13,900 and 13,750. Finally, the Dow is meeting psychological resistance at the 14,000 mark. Is this a double top? 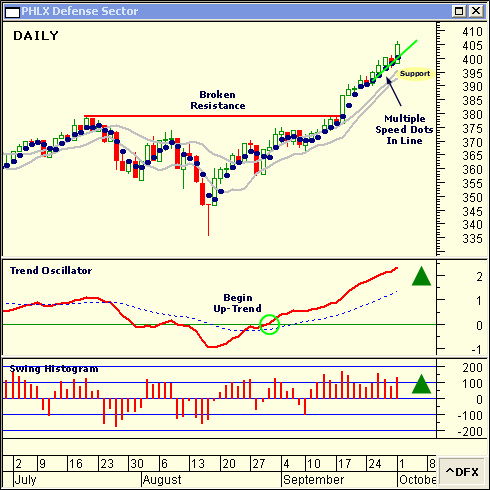 The PHLX Defense Sector Index (^DFX) is battling forward into new territory. Will the front line hold? 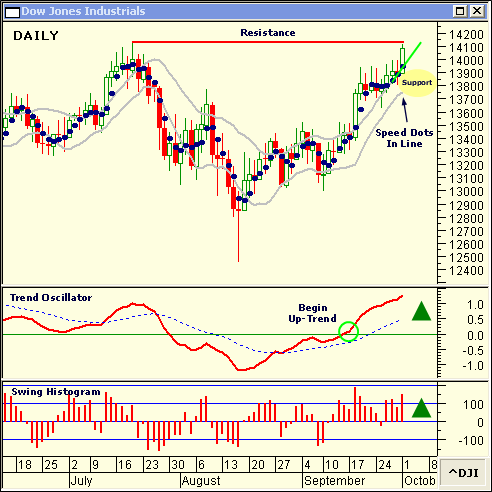 The Trend Oscillator marked the beginning of the current up-trend in late August on the daily chart. 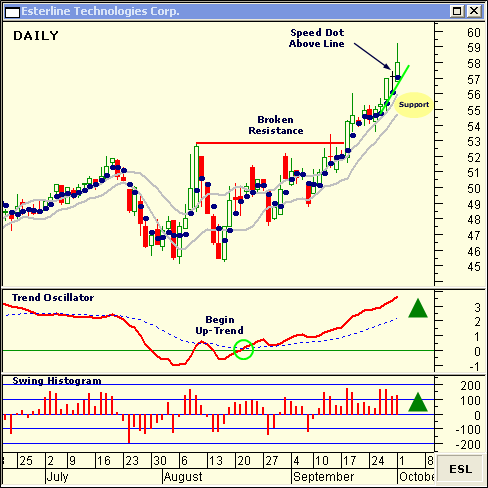 Resistance was cleared in September with a wide-range break-out. Furthermore, the Swing Histogram remains pegged above the zero-line... a sign of upward trend strength. Also, a narrow area of support is delineated by the moving average channel near 395. Look for the Defense Sector to pull back to support before fighting to higher ground. Esterline Technologies Corp. (ESL) is a component stock of the PHLX Defense Sector Index. ESL engages in the design, manufacture, sale and marketing of engineered products and systems to the aerospace and defense industry in the United States and internationally. On the daily chart, ESL broke resistance in mid-September... leaving behind a large area of congestion. The Speed Dots trending above the moving average channel are an indication of the underlying trend strength. Expect ESL to trade down to support between $56 and $55 before advancing further. This month, you were introduced to some "new" indicators without any explanation. As you'll soon see, the only thing new about these indicators are their names. Don't worry. I explain everything in my new, soon to be released, trading book.